Cooking with truffle oil can elevate an everyday dish into a gourmet experience. The highly flavorful truffle-infused oil pairs well with multiple flavors to impart an earthy truffle flavor at a fraction of the cost of incorporating shaved truffles into recipes. Try adding truffle oil the next time you cook to make your meal even more special. Truffles are a mushroom-like fungus that grows under the ground. You can find truffles in various regions, including in Italy, France, Croatia and Oregon. Because of their rarity, they are one of the most expensive delicacies in the world. When chefs use truffles in food, they typically shave them into very thin pieces to impart the distinctive truffle flavors to the dishes they create. The two main types of truffles are black and white. Black truffles typically have a stronger flavor, while white truffles are more delicately flavored and scented. While truffles are quite expensive, truffle oil provides a far more affordable means of imparting truffle flavors to dishes. There are two ways to make truffle oil. Manufacturers steep truffles in some base oil - usually olive oil - in order to impart flavor to the oil. Manufacturers use artificial truffle flavor in the oil to add truffle flavor. Oils flavored with actual truffles tend to be very delicate and more expensive than oils containing artificial flavors; many artificially flavored oils have wonderful truffle flavor and hold up well over time. Artificially flavored oils may also stand up fairly well to moderate heat and have a stronger truffle flavor. When cooking with truffle oil, the best way to preserve the delicate flavors of both natural and artificially flavored oils is to drizzle it onto warm food after you have completed cooking it. If you add it to food while it cooks, you may destroy the truffle flavoring, particularly if you are using a naturally flavored truffle oil. Truffles work equally well with a simple dish like scrambled eggs, or a more gourmet meal such as lobster bisque. Try these suggestions. Truffles enhance mushroom flavors; try making some delicious mushroom risotto with truffle oil. 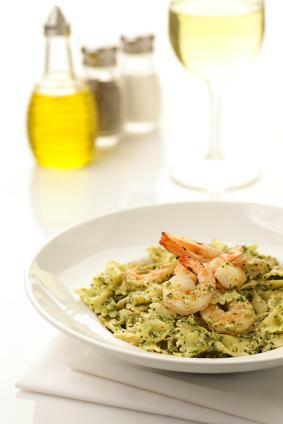 Drizzle truffle oil over plain pasta or use to finish seafood pasta. Finish a lobster salad with a drizzle of truffle oil. Swirl truffle oil into lobster bisque or seafood chowder. Add a few drops of truffle oil to grilled vegetables. Mix truffle oil and butter and use to top a steak. Use as a dipping oil for focaccia or a crusty French bread. Toast crusty bread and brush it with truffle oil. Top the bread with shrimp scampi and some parmesan cheese. Soft cook polenta and drizzle with truffle oil. Toss gnocchi with browned butter, truffle oil and parmesan cheese. Drizzle truffle oil over roasted fingerling potatoes. Pour a little bit of truffle oil over roasted chicken. Add a few drops of truffle oil after you sauté mushrooms. Add truffle oil to butter and use for dipping seafood such as crab, clams, lobster, or shrimp. Add a combination of truffle oil and butter to popcorn. Using truffle-infused oil to finish the foods you make adds a unique flavor to your meals and snacks, but be careful. Once you've developed a taste for truffle oil, you'll want even more. Fortunately, truffle oil is fairly affordable and your options are limited only by your creativity.